We have often spoken of the problems that are specific to established churches, whether they are Roman, Anglican, Lutheran, or a few others. In Lutheranism, we have the words of Luther himself to go by, in the Augsburg Confession and some as well in the Book of Concord. But they were written in a very different world, I hear you say. Yes, they were but, so was the Bible itself. It is for us to (and our spiritual advisors) to apply it to our world. I note that traditional Calvinism has a similar doctrine although seemingly it has been superseded. One note to our British and American readers should make is that our conception of the people holding sovereign power over the state died out on the continent someplace between the 9th and the 12th century, leaving the whole shebang to be imposed from the prince and forced downward, so we have to translate that concept to our own. That is also why so many of us decry the UK’s membership in the EC. The Lutheran Two Kingdoms is the direct counterpart of the Roman “Two Swords” established in the bull Unam Sanctam, issued by Pope Boniface VIII, which posits that there is only one Kingdom, the Church which controls the Spiritual sword and that the Temporal sword is hierarchically lower than the Spiritual, thus allowing interference in the state by the church. It also owes much to St. Augustine’s City of God. I also note that James Madison, the principal author of the !st Amendment to the US Constitution credited Luther as the principal theorist behind it. In any case, Wikipedia says (I know but it correlates with what I know) that Luther and Philip Melancthon’s doctrine which was later labeled “two kingdoms” was that the church should not exercise worldly government, and princes should not rule the church or have anything to do with the salvation of souls. We are seeing in our time and actually have been since at least the 30s with the rise of the secularists the mischief that having the government involved in the church can cause. In the States we are seeing attempts to force Christians to pay for things (like abortion) that are strictly forbidden by our faith. Additionally, there is a case currently in Louisiana where a court is attempting to force a Roman Catholic priest to violate the privacy of the Confessional. In the UK we are seeing the established church being coerced to amend its doctrine in line with government policy, and in addition beginning to officially harass clergy who state the doctrines on diverse things plainly in public, as well as efforts by both the civil authorities and their hirelings in the church hierarchy to silence orthodoxy. In both countries we are seeing essentially an effort to reduce the Freedom of Religion to the freedom to worship. If it is successful we can, and should, expect it to be the beginning of still another slippery slope. We should be aware that this trouble started long ago, when the Romans abandoned their traditional tolerance, and demanded that all worship at the Cult of Caesar. 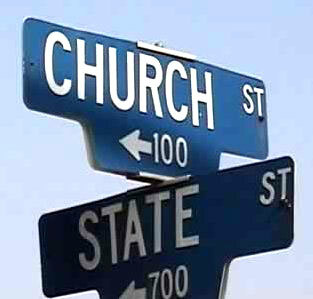 The major lesson in the doctrine of the Two Kingdoms is that there is not (nor can there be) a Christian civil government, and that it is equally wrong for the Christian to allow the civil government to intrude on one’s Christianity. There is an outstanding essay here from Hermann Sasse.